Situated in North East England, Northumberland borders Cumbria to the west, County Durham to the south, Tyne & Wear to the South East and Scotland to the North. Located on the border of England and Scotland, Northumberland warehousing offers an excellent location for companies distributing their goods in both countries. Sunderland, Newcastle upon Tyne and Carlisle are popular trading cities just outside of Northumberland. If you’re looking for warehousing and distribution in this area, 3PLs in this area provide both nationwide and international distribution. Northeast warehouse services available in this area include commercial warehouse racking, pallet storage, bulk storage, pick and pack, order fulfillment, stock management, shrink wrap, CCTV monitor, 24/7 surveillance and much more. Potts Print (UK) Cramlington warehouse space is BRC approved. 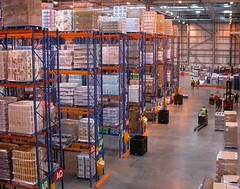 Whichwarehouse is able to assist in finding suitable warehousing for companies looking to store their commercial goods. Click the link above to search for current availability of Northumberland warehousing and distribution within our network. Alternatively, if you would like help searching for suitable warehousing in Northumberland and surrounding areas, simply call the Whichwarehouse team on 0800 1707 555 and we will be happy to help.